The new Mercedes-Benz M class has a unibody construction instead of the body-on-frame that was used on the first-generation M class. The change was made because many SUV buyers prefer comfort and road handling rather than off-road ruggedness. Drivers will no longer accept feeling that they are driving a truck, says Thomas Mercker, development director for the M class. 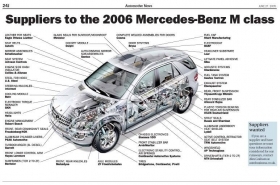 Using a unibody also allows Mercedes to market other vehicles off the same architecture. The new R-class SUV/station wagon crossover is built alongside the M class in DaimlerChryslers US plant in Vance, Alabama. Delphi delivers pre-assembled cockpits to the line, as it did for the previous M class. One change for the new vehicle is that Delphis cockpit incorporates a heating/ventilation and air conditioning system from Behr Hella Thermocontrol. Stamping specialists Ogihara, Magna and Oxford deliver a large part of the body-in-white structures. TRW Automotive provides the M class with a system that moves headrests forward and tightens seat belts during an emergency. Complete front and rear axle modules are delivered by ZF, which had a high level of freedom in selecting suppliers for the program. The German suppliers rubber-metal division, ZF Boge Elastmetall, engineered the M class chassis bushings – the points where the axle is bolted to the vehicle body.